The road from Kuala Lumpur to Genting (amusement park and tourist hill station town) via Hula Yam Baru is a legend in the KL-based motorcycle enthusiasts' minds. And I got to experience this mind-blowing twisting road on board a CBR150R ages ago, long before bikes like the R15 arrived here. I have very good memories of that day, but to talk of the motorcycle, I have two. One, the CBR150R was so skinny that I thought my knees would touch when tucked in. And two, the motor liked revs and had to be pinned to nearly 12,000rpm to get any sort of work done - though I do remember pulling a wheelie or two off the lights (I was told cops don't mind as long as I don't fall off, then it's go straight to jail time). In 2002, Honda launched this motorcycle in a few South-East Asian markets, as a replacement to the NSR150. And it was this generation of the CBR I rode in Malaysia. The motorcycle as we know it was launched in October 2010 in Thailand as a 2011 model. It sported roughly the same frame with a change in the rear monoshock linkage and minor updates to the forks. The engine received a thorough going over - the 149.9cc oversquare liquid-cooled fuel-injected single received a new throttle body, shorter piston pins, the forged piston had shorter skirts and the camshaft profiles were made more aggressive. The big change of course, was the styling, which took on the layered fairing from the CBR250R shrunk to size. Fetching in the two- and three-colour paintjobs. And it is this motorcycle that Honda has now brought to India. The entire engine is imported from Thailand and the rest of the parts have been localised. In fact, as you will see, that is one of the things that works against the motorcycle. Honda have been using this bike for their one-make racing championship and the clamour for it to be launched has been on for sometime. All that is history. Now let's get back to the present. Like I always seem to say, I'm not a VFR-fan in its current form and so the CBR250R isn't my cup of tea in the design department. And so I was expecting not to like the CBR150R either. But surprise, I like it a lot. The shrinking of the CBR250R fairing has led to flatter, more lithe surfaces that give the motorcycle a sense of civilised aggression. There are little details like the dip in the painted plastic over the top-middle of the headlamp and stuff that are the visual differentiators vis-a-vis the 250 but the easiest way to tell them apart are, of course, the tyres and the exhaust. The can, I like, is shorter, stubbier and looks very nice indeed. When examined more closely two things become clear. First, finish levels are, as usual excellent but there are problems. The stripping on the brushed metal finish surround on the (otherwise) CBR250R clocks makes the bike feel cheap and when you zoom out a bit and note the Stunner-style switches with a missing engine kill switch as well as a passflasher, the CBR150R feels cheaper still. I also didn't like the shiny black paint on the twin-spar frame - the earlier CBRs had matte black which I thought looked classier. But these are bits and parts and the overall impression is of a good-looking, mildly aggressive faired motorcycle of good quality. Job done, I'd say. The CBR uses an oversquare single-cylinder engine with a six speed gearbox. The engine is a high-revving unit that produces 12.66Nm of torque at 8,500rpm followed by 17.82PS of peak power at 10,500rpm. Redline is 12,000rpm. These peaks are very high in the rev band, to give you an example, the Yamaha YZF-R15 makes its 17PS at 8,500rpm, where the CBR makes its peak torque. What this promises is a rev-hungry monster of a motorcycle. Which, unfortunately it isn't. In traffic, the lack of low-down torque is immediately obvious. In fact, it feels slower even than the R15, which we have said in the past was a bit slow in this department. But the problems really begin when despite enthusiastic use of the throttle and the slick gearbox, the performance doesn't take off. There is a change in the mood past 8,000rpm but it still continues to feel a bit reluctant. Our test figures reflect this. The CBR gets to 60kmph in 4.94s which is 0.15s slower than the R15. The hundred comes up in 13.23s and top speed is 130.74kmph. It appears unable to be able to catch the R15. This is even more baffling given the fact that it weighs exactly the same as the Yamaha and it isn't even a gearing issue which should at least have given the CBR a top speed advantage. Further, it isn't as smooth and vibe-free as the Yamaha YZF-R15 and that surprised us once again. What is impressive, though, is how smooth the fuel injection system is and even rolling on from a closed throttle, this is one of the few bikes that come back on the power without a hiccup. The economy figures were a surprise.In the city it returned 44.89kmpl while out on the highway the figure jumped to a head-scratching 67.5kmpl, This means the overall figure is 50.5kmpl and before you jump up and down with glee, I must point out that it mystifies me. Why would I want this kind of economy from a CBR like this? I'd rather have the performance. My past experience with the CBR150R was of a rev-hungry, rev-happy, redline-friendly motor but this CBR isn't like that at all. It can cruise effortlessly at all speeds, but appears to be holding back when it comes time to give its all. It is in this department that the CBR shines. It sometimes feels like it's wearing the CBR250R's suspension (it is not, it only feels like that) and the lighter weight of the motorcycle is allowing it to work far, far better. Ride quality is a very nice blend of the well-damped and sporty-stiff. It doesn't waft over bumps like, say, the Hero Impulse, nor is it anywhere close to being as gnarly as the KTM 200 Duke. Where the CBR250R is softer and can feel wallowy as a result, the 150R feels secure, damped and still nearly as comfortable as its bigger brother. On the other hand, it feels really neat and tidy in the corners. The skinnier tank and the slightly more forward leaning riding position combine nicely and the CBR inspires instant confidence. The chassis responds beautifully to your inputs and you will find that upping the corner speed is no effort whatsoever. And that's where the engine, once again, holds the motorcycle back by supplying less power than you'd like on the exits. My racing buddies say the CBR will be good for the Group C class and the engine will be easy to tune. And once there is more power reaching the rear wheel, the CBR should - they say - have the measure of theR15, if not outright victory. MRFs or indeed, the still more expensive MRF radials on the Duke. I believe that this chassis would respond wonderfully to a set of skinnier, softer-compound tyres and it is already a to do list our long termer. Finally, the brakes. The brakes are discs, 276mm and 220mm (front and rear) Nissin units. Brake force appears adequate and is delivered in a progressive, feedback-rich manner, just like a new rider needs it to be to feel confident. However, our test results show that the Honda takes a bit longer than expected to come to a full stop from 100kmph. The Honda CBR150R's star qualities are its design, finish levels and the handling. What you should be buying it for is its ability to be a fast-looking, but easy to live with, commuter motorcycle in the sporty-faired mould. But there clearly are weaknesses as well. Power, acceleration and braking are less than we expected and that takes the edge off the motorcycle. But there is a bigger question still. The Honda is priced at Rs 1,26,488 ex-showroom Mumbai for the Deluxe version (which gets the orange and white paint job you see in these images), which makes it Rs 1,000 more expensive than the Yamaha R15. Shouldn't a product following the R15 into the market years later at least beat it on at least performance if not performance as well as price? All told, the CBR appears to be expensive for what it is. For Honda fans, though, this could be good news in a twisted way. 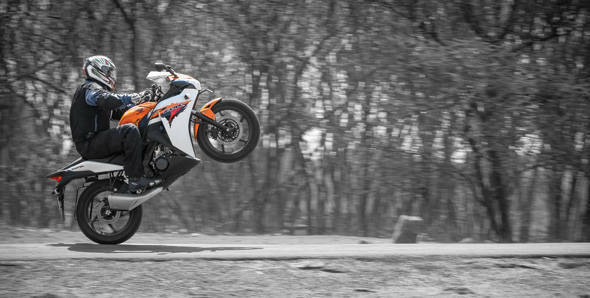 The CBR250R is just Rs 30,000 more!